1. Crush (break the skins) and de-stem the grapes. For most grape varieties, about 90% of the larger stems should be removed. 2. Test for total acidity following the instructions in your acid testing kit. If the acidity is less than .6%, add enough tartaric acid to bring it to that level. 3. Test for sugar with your hydrometer. Correct any deficiencies by adding enough sugar to bring the reading up to at least 22° Brix or add water to bring the sugar down to a range between 22° and 26° Brix. 5. Unless you have found it necessary to add more than 65 parts per million SO2 in step 4, yeast should be added immediately. If using more than 65 parts per million SO2, you must wait six hours before doing so. 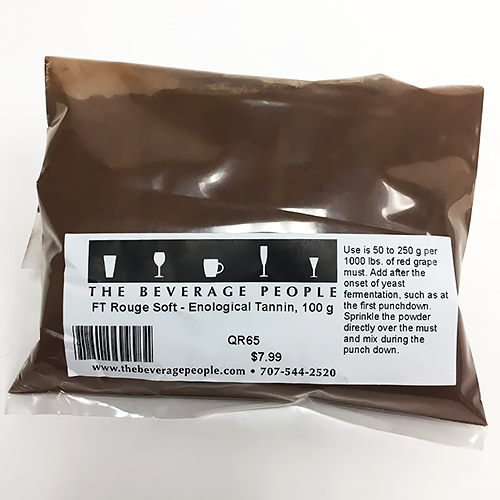 Add 1 -2 grams of dry wine yeast per gallon evenly across the surface of the crushed grapes (now called “must”). Stir it in thoroughly after eight to twelve hours. Also, begin your nutrient program using Fermaid K and/or DAP. 7. Throughout fermentation, the temperature of the must is usually between about 60 and 75°F. 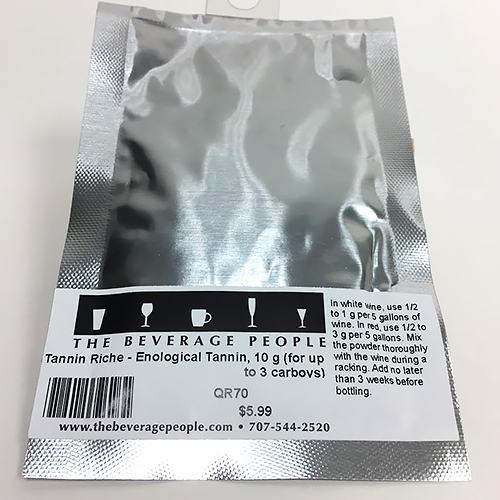 For better color extraction from the skins, it is helpful to allow the temperature to rise at least once to the 80-90°F range. The fermentation itself generates some heat, which helps warm the must along with warm fall weather. If it is late in the season you may need a heater. 8. When the wine has reached 0° Brix the grapes should be pressed to separate the wine from the skins. This is usually about 1-2 weeks of fermentation at 70-80°F. During pressing, collect the wine into a bucket under the press and funnel the wine into secondary fermentors. Attach fermentation locks, and allow the containers to settle until all visible signs of fermentation have ceased (several days to a week or so). Top full when all activity ceases even if you have to add wine from another batch, or buy a similar wine, remember, you get to drink it later. 9. Add an ML (malolactic) culture (optional) to the wine which, in the case of direct pitch strains like Enoferm Alpha™ or Viniflora™, is added to the secondary fermentors after pressing. 10. When the wine has begun to clarify in 1-2 weeks, rack the wine off the gross lees into clean, sanitized storage containers (glass, stainless steel, or oak). Top up the containers and let stand for a month. If ML fermentation is still active do not add sulfite during this time. 11. After one month, rack the wine away from the lees again, add sulfite to 25 or 30 ppm, and keep in topped up containers for four to six months. You must top up barrels, and visually inspect the carboys. This is a good time to add oak alternatives such as sticks or cubes. Add sulfite every few weeks. If you inoculated for ML, test the wine to be sure it is complete. 13. 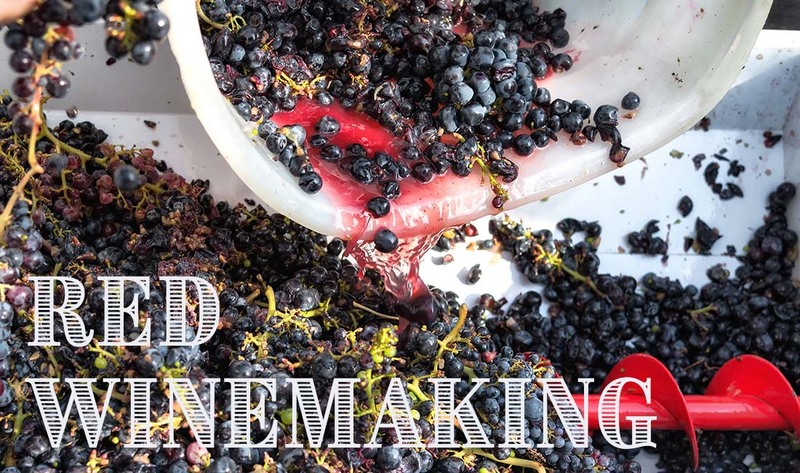 Usually during the summer (just before you need your storage containers for the next year’s crush), carefully rack the wine to a sanitary bottling container, then siphon into bottles and cork them. Keep the bottles neck-up for one week to allow the corks time to expand, then move the cases to their side or upside down for storage. Bottling time is your last opportunity to make sure the wine will be bottle stable, so test and adjust the sulfite to 30 ppm. If this is a sweet wine, add Sorbistat to keep the wine from further fermentation. Most red wines will benefit from at least one year’s additional aging. Rack to bottling container, adjust flavor with oak extract, add sulfite, cork and store.